Tintype Image by Bryan Hiott. 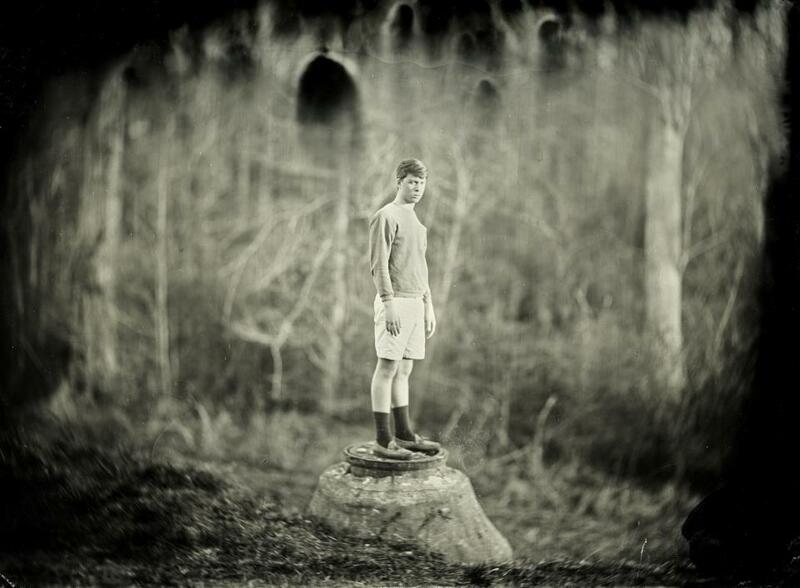 Plate Size: 2 7/8″ x 3.5″ (Wet Plate Collodion Process). 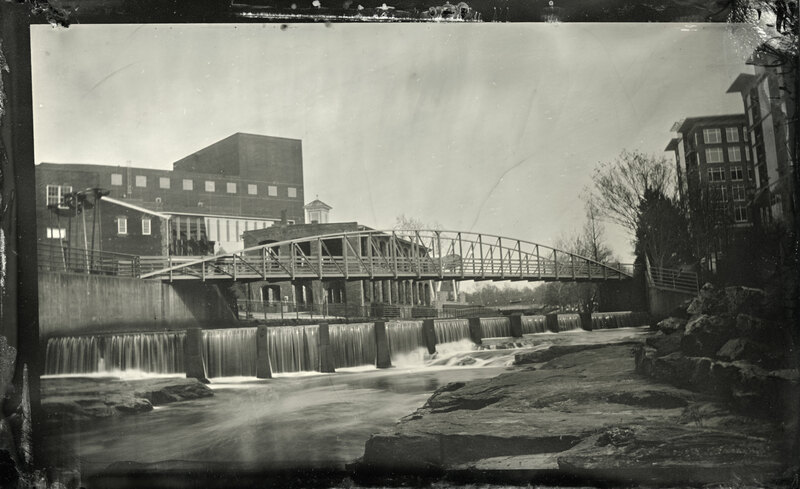 This is a tintype image of the crossing at Reedy River behind the Peace Center for the Performing arts in downtown Greenville, SC. The crossing is part of Greenville’s vibrant downtown life, connecting two walking paths along the Reedy River near Main Street in an area that features artist galleries, restaurants, shopping and hotels as well as outdoor performance spaces. This is a recent tintype that I made just outside my studio, which is in an old Textile Mill in Taylors, SC. Just across the street from the studio is a vast field, part of which is marshy, that extends for over a mile to a railroad trestle. The field is surrounded by dense forest, and I thought it was a perfect location for making a tintype portrait. This subject of this whole plate (6.5″ x 8.5″) is Jamie, the son of an artist friend, who will be going off to college in the fall. As I processed this plate, I allowed it to remain in the fixer for a much longer time than normal, causing the collodion to begin to dissolve around the edges. The mysterious looking terrain behind Jamie seems to be melting away – just as the world of high school is, as he prepares for college life in an art school. Yet he is standing on a solid platform – not the literal concrete drainage entrance – his own emerging sense of self as artist. He’s a very gifted photographer, and I’m sure we’ll continue to see more amazing work from him in the coming years. This is my first blog post in a while. A move will do a lot to interrupt a normal routine. So will a new job. So will taking a new studio. All three happened to me last summer – at once. After 15 years in New York City, my wife and I moved back home to Greenville, South Carolina, where I opened a new photography studio in the old Taylors Mill. I also began teaching art history and studio art at The University of South Carolina – Upstate. 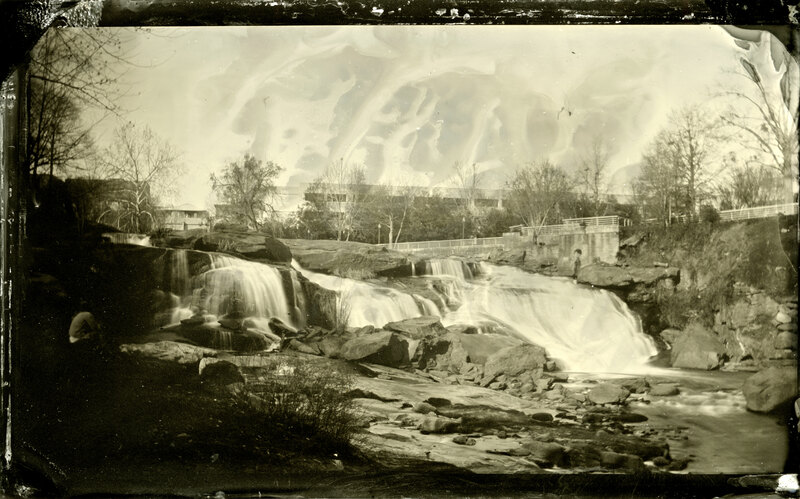 But it is time to resume my postings, and I am including here a tintype that I made this week on location at the Reedy River Falls in beautiful downtown Greenville, SC. I will post more of these location images in the coming week. The tintype below was made with a 1916 Kodak Brownie camera. It was a cold day, which can bring issues with the chemistry, and I was using old developer – which accounts for the stormy-looking streaks at the top of the image. In spite of all that, I still like it very much. The Reedy River Falls were long obscured by a 1960s era bridge, connecting Camperdown Way with the lower Main Street area on the West End. As part of its downtown revitalization plan, the city of Greenville approved the demolition of the old conventional bridge and replaced it with the Liberty Bridge, a unique, curved and cantilevered suspension bridge for pedestrian traffic. Providing dramatic views of the falls and the city beyond, the Liberty Bridge has become extremely popular with downtown visitors and is iconic of a progressive Southern city. Thanks to the superb leadership of Mayor Knox White, Greenville has become attractive to international businesses and professionals seeking a combination of affordable location, great quality of life, ample cultural resources and a modern, vibrant downtown. I’m happy to be back here! 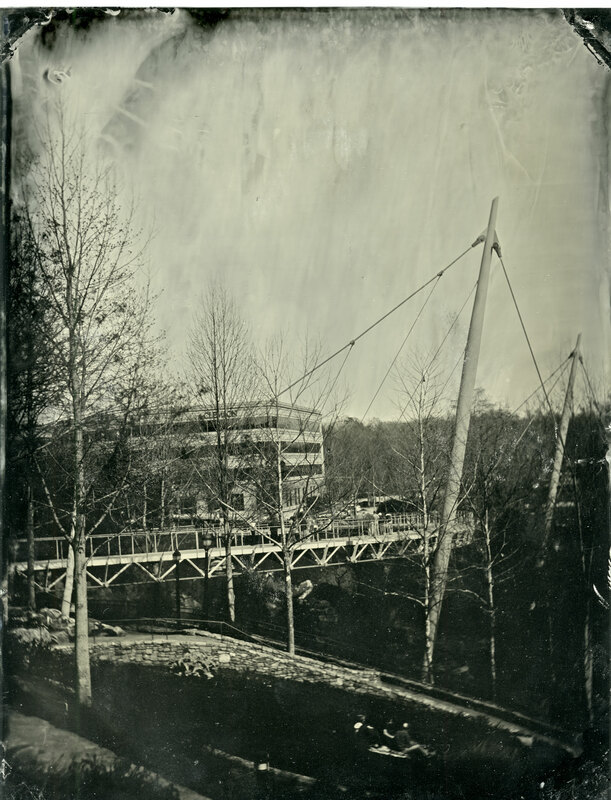 Tintype of the Liberty Bridge, Greenville, SC (Whole Plate 6.5″ x 8.5″). Taken with and 1872 Ross lens.